Nikko is located 120km north of Tokyo. It has been a religious sacred place since 8th century when a Buddhist priest founded a temple. There are two shrines and a temple in the center of the area, which were designated as World Cultural Heritage sites in 1999. In this tour, we leisurely walk around these shrines and temple and enjoy delicious local food at lunch. Nikko is one of the best places for a day trip from Tokyo with its easy access. Luxury limited expresses take you directly to Nikko from Asakusa in about two hours. 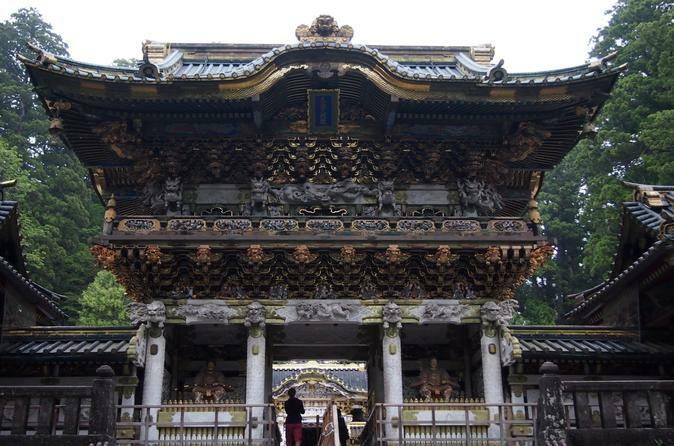 You can enjoy many historical and religious architectures as well as natural beauty in Nikko. Toshogu shrine is the main attraction of this tour. It's a Shinto shrine dedicated to Tokugawa Ieyasu, the first shogun of Tokugawa shogunate in the early 17th century. He is one of the greatest samurai heros in the Japanese history that brought Japan 260 years of peaceful times after a long warring states era. It’s gorgeous and elaborate carvings and sculptures decorated all over the buildings must be one of the best memories in your Japanese trip. Taiyuin is just a five minute walk from Toshogu. It's a mausoleum of Tokugawa Iemitsu, the third shogun of the Tokugawa shogunate in the mid-17th century. He deeply respected his grandfather, Ieyasu, and dedicated Toshogu shrine today to him. The buildings are also covered with splendid carvings and sculptures and you can appreciate them in quieter circumstances. Rinnoji temple and Futarasan shrine have different historical and religious backgrounds to Toshogu and Taiyuin. Rinnoji temple was originally founded in the 8th century by a Buddhist priest, Shodo. It had been the sacred place of mountain worships in Nikko for more than 1,000 years. You can see a unique Japanese religious history based on the fusion of Shinto and Buddhism, two major religions in Japan, in the temple. Futarasan shrine was also founded by Shodo in the 8th century and has enshrined three sacred mountains in Nikko, Mt. Nantai, Mt. Nyoho, and Mt. Taro. The buildings were constructed by plain woods and have no decoration unlike Toshogu shrine. The current facilities were built in the early 17th century and the oldest buildings in the area. These religious facilities are located among towering cedar trees in mountainous area. You can enjoy strolling around those grounds while watching sites filled with religious atmosphere in this tour.